The hour long appointment with our Design Team is FREE with no obligations and the results and confidence our clients finish with are priceless. We may be biased, so you be the judge, follow all our local project Concept Consult blog posts and see the selections first hand. Our Client is building a home on the Surf Coast at Jan Juc. 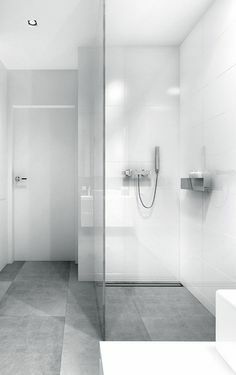 The Concept Consult objective today is selecting tiles for the bathroom, toilets, pantry, and ensuite. Building will start May of 2015. Being a beach front home, we (the client and I) wanted the home to have a natural airy feel. 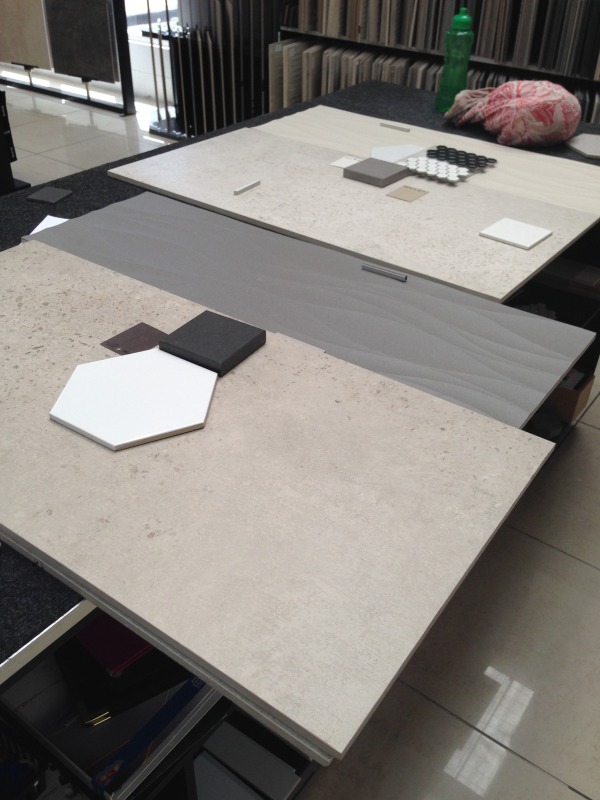 Our client entertains often so we also wanted to make sure our tile selection could withstand high foot traffic. We started with the ensuite selecting a large format concrete look tile for the floors and some walls including the toilet area. We wanted this space to be light and airy and have a relaxing calming feel, this will be our client and her partner’s retreat. 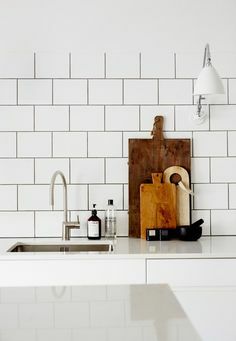 This tile is available in a few colour options, we selected the lightest colour, “Ivory”. Complimenting this tile we chose a “crema” colour wave tile for the shower feature, with a “Sleek Concrete” Caesarstone bench top and two laminate options for her vanity. Above: Selections for her ensuite and toilet area. 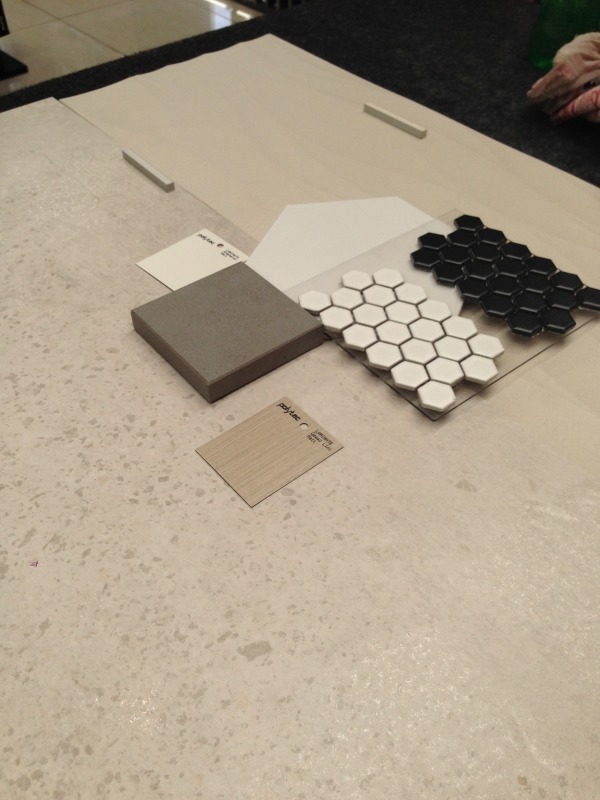 The toilet space will feature the same concrete look tile and Caesarstone benchtop with a white gloss hexagon mosaic for the splashback. 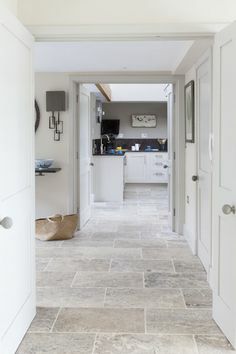 Moving downstairs, we decided to go with the same theme as upstairs, but instead of using the light “Ivory” colour for the floor we are using a darker colour, “Ash Natural”. The next floor is where her boy’s bathroom is. We wanted a dark colour to make it more masculine and ideal for high traffic and dirt. Above: Masculine neutral tones for our client’s son’s bathroom. We complimented the “Ash Natural” concrete floor tile with the “Steel Grey” wave tile, which will be a feature in the shower. The benchtop will be “Jet Black” Caesarstone, with a white gloss hexagon tile on the splashback, finishing with a dark timber laminate for the vanity. Our client left thrilled and excited for her build to start and finish. 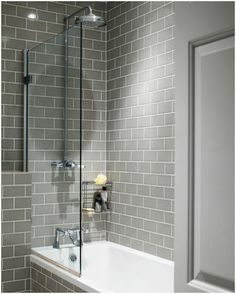 Now all she has left to do is sit back and relax, everything from the vanity to the grout colour is chosen. No more worries for this client! 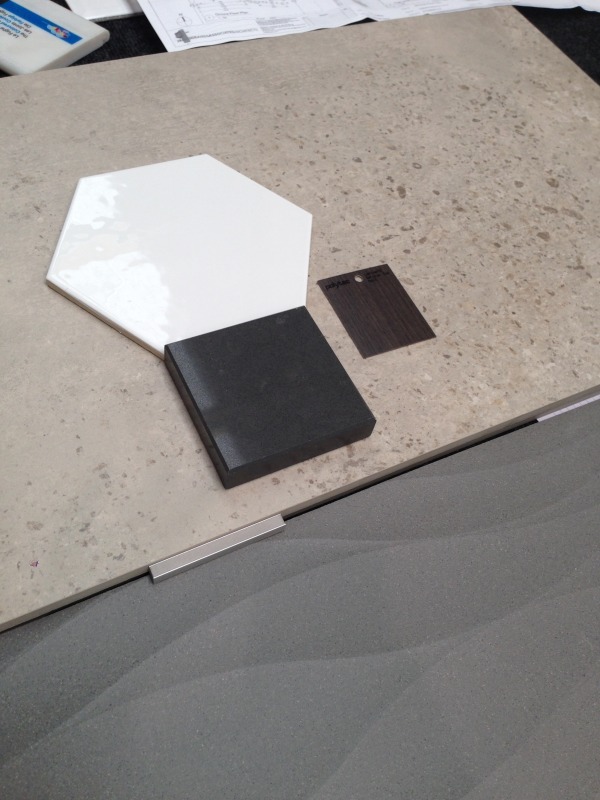 Need assistance with your tile and colour selection for your new home or renovation? Book your complimentary Concept Consult with our Design Team for designer advice and beautiful products at your finger tips. No obligations, just fabulous results personalised to you.